Some choose to use Brandy - which has a distinct smell. Don't be tempted to use water from your tap. It must be distilled! Put the essential oils together creating a smell you like. - top notes (smell of oil evaporates first). Oils all evaporate at different rates the perfume may smell different as time goes on. 1. Essential Oil - mix at least 25 drops total of essential oils divided evenly between base, middle and top notes. 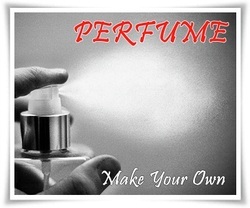 - Start with the base notes, then middle, then top, smelling as you go. 2. Vodka - Add 2 1/2 ounces of alcohol, shake for a few minutes, then let it sit for 48 hours (or up to 6 weeks-the longer it sits, the stronger the smell). 3. Water - Add 2 tablespoons spring water, stir, then pour through a coffee filter and put it in a bottle. P.S. The oils are stirred slowly into the alcohol, one drop at a time. Stir slowly but long enough for the oils to be completely dispersed.